Brightening your world with efficient, modern, landscape outdoor lights. Questions about replacing an existing lighting system or getting a new installation. How do I get an outdoor lighting estimate? Contact us for a visit to discuss your needs and to possibly perform a demo after an estimate. Schedule a Demo where you can see how your home will look. We will schedule the work and get the job done. What Lighting brands do you install? We presently install all lighting brands including Kichler Lights, and FX. 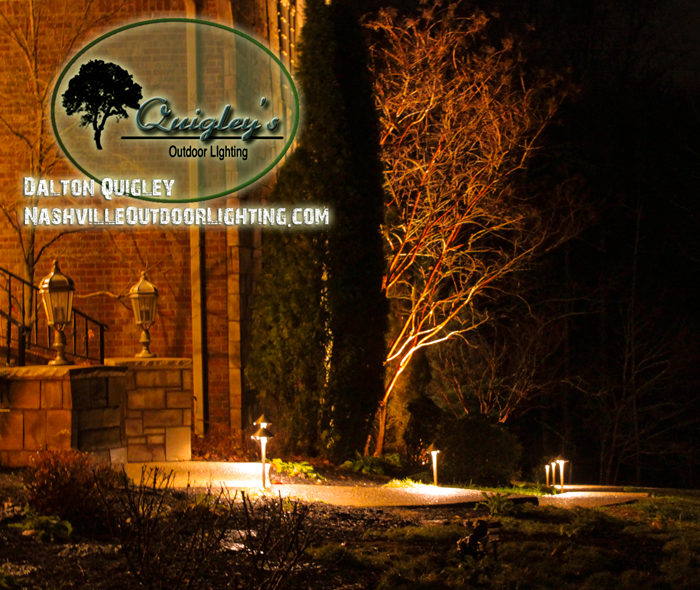 Quigley’s Outdoor Lighting has been doing landscape related projects for over 20 years. 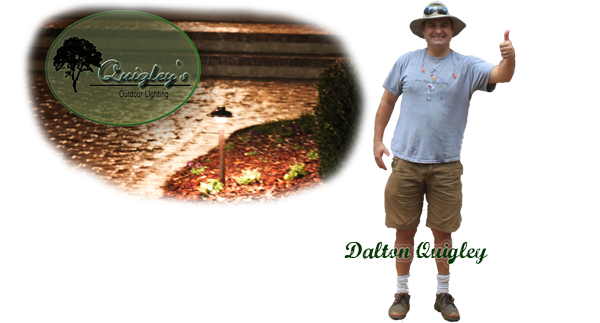 A few years ago we added Outdoor Landscape Lighting to our services we offer to Nashville area clients. We view the illumination of your property as a way to get even more hours of use and you can enjoy the aesthetics of the architecture even more as they are highlighted by outdoor landscape lighting. If you are ready to get lighting installed get in touch with us for an estimate. What is outdoor / landscape lighting? This type of lighting for your home is typically installed in strategic areas that show off the finer features of your home and landscape while illuminating the area for safety and convenience. There is a transformer, low voltage wiring and fixtures, and during the day these items are mostly hidden. Once the sun sets your lighting system turns on and now you are able to get 24hours a day of use out of your property. A landscape lighting system is more than the sum of its parts, it is the ability to drive up a driveway safely without the danger of coming near unseen objects near the road, an illuminated path for a safer walkway from tripping hazards, and it has been proven that burglars are more attracted to a dark home where they won’t be seen from a distance. In short Outdoor Landscape Lighting is beauty, safety, security, and peace of mind. We proudly service the areas of Nashville ( Bellevue, Crieve Hall, Belle Meade, Forest Hills, and Green Hills ), Brentwood, Franklin, Spring Hill, and Nolensville TN, with landscape lighting services. No matter how you think of it at night you have to see to be able to get to your destination, maybe you use your smart phone’s flashlight ap, maybe there is a street light near by, it could be that the lights inside of the home provide just enough to get inside, or you have solar lights that dim out after they run out of battery life. With path lights you can have a clear view of your travels around the home, this can provide an improved ability to see obstacles. For some darkness may be the view of their home from the street and others may simply be looking at a shadow that falls from a street light and tree over their home. Architectural / structure lighting will show off the finer features of your home while illuminating the other less important but necessary parts of the view. Did you know you are only getting 1/2 of the value out of your landscape when it isn’t illuminated at night? Low voltage lighting powered by your home is low maintenance, low on the electric bill, modern, adds value to the appeal of your home, and is easier to use than candles, lanterns, tiki torches, and doesn’t add the negatives of gas lights. The electric wiring is unseen and the fixtures are mostly hidden for a natural effect. What would your home look like with outdoor lighting? What if there were a way to see how your landscape and home would look with outdoor lighting? Get an estimate to see what your home looks like illuminated and find out how to get more use out of the home you have worked so hard for. You will find all of the outdoor lighting and landscape lighting help to have the ideal illumination system installed at your home. Add more lights to your existing system.